This evening, I watched an episode of The Twilight Zone. The main character, Horace, had idealized memories of his childhood and he wanted to go back to his old neighborhood. He did, and his experience was like quantum physics where time goes all warpy. Everything looked the same, the same people were there, and they were all the ages that he was when he lived there. Of course, his wife thought he was cracking up, even though she was a bit freaked out by the kid from the neighborhood who kept showing up at their apartment every time Horace went there. Have you ever felt like you could, in your mind, go back in time? We know the memories are in there, complete with smells and sounds and emotions. What if we could access them? We could smell our grandma’s perfume (mine used Avon, one of her favorites was Cotillion), and a favorite meal (one of mine was her fried chicken, corn on the cob and green beans with potatoes). Maybe it has something to do with living in the 50th decade of my life, but there are times that I almost feel like I could just dig these places out of my brain and experience them all over again. I can almost smell the Pine O Pine that my mom mopped the floors with, along with the Pledge that she used to polish the furniture. If you just add in the cookies and the pine tree in the living room, it’s Christmas in 1966. I know the memories of conversations that I heard have to be in my mind somewhere. If I could pull this stuff up from the memory files, I’d see myself on the floor playing with dominoes, lining them up and making them all fall while I listened to the adults talk, and I’d actually hear the whole conversation. I don’t have an idealized concept of my childhood like Horace had in The Twilight Zone, and I wouldn’t want to go back and be a kid again. I’m happy with my life in the here and now. But do you ever wonder what it would be like to pull those memories up to the level of feeling like you are there again? Well, it’s after midnight and I need to hit the sack. I wonder what I might dream about tonight? 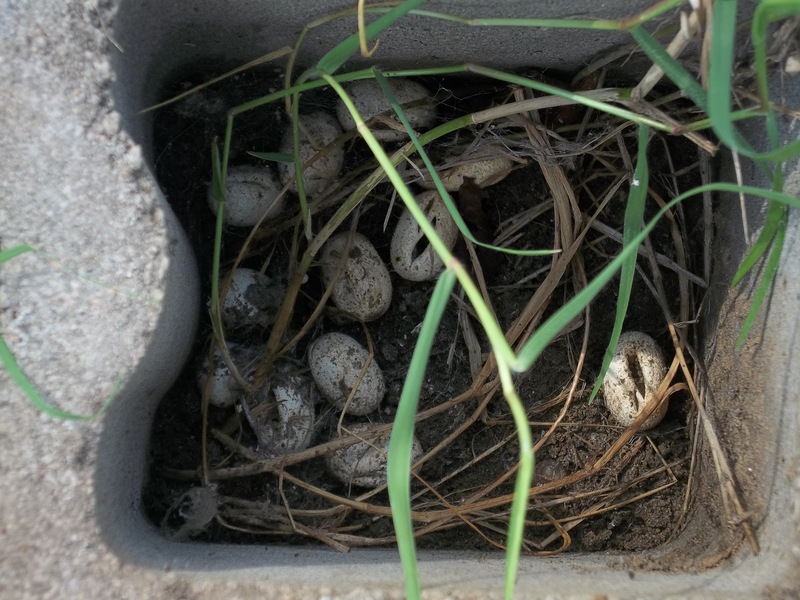 Ya’ Reckon These Eggs Belong To Our Rat Snake? A few months ago, I was getting the concrete blocks around the garden all in order, and preparing to put up a fence. We had expanded the garden and I needed to fill in some space with blocks, and also there were weeds to pull. We have some of those concrete block with holes in them laying on their sides, with the holes up, but with some concrete scallop edging laying on top of them. It covers the holes and I like the little scalloped edges. Why keep the concrete when we’re putting up a fence? Because an armadillo won’t dig under it if there’s concrete there. Well, maybe not just one armadillo. Sometimes in the morning, my yard looks like there was a whole group of drunken golfers out there all night. Anyway, the edging wasn’t all lined up perfectly, and a snake found a way into the hole. “What a nice protected place to lay my eggs,” she thought. I’m sure she thought that, and also, thanked me. Since finding the eggs, we’ve seen a huge rat snake at least three times in our garden. (I don’t know where the babies went; haven’t seen a single young one.) She’s (I just know it’s a she and she’s the momma of those eggs) almost as long as my broom handle. I figured that out by seeing where her head was and where her tail was at the same time and putting the broom on the ground where she had been. I speak to her every time I see her. I’ve tried to work along side of her. She’s just not friendly. She runs from me. Which is why I tell folks not to run from snakes. Why run from something that’s already running from you?